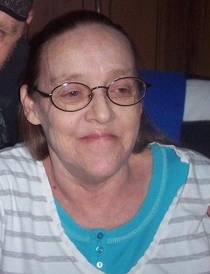 Linda Kay Crowder Mullins, 63, of 1086 Main St., went to be with her Lord and Savior on Sunday, March 17, 2019. Born in Galax, VA, she was the daughter of the late Wilford David Lundy and Thelma Lois Crowder. In addition to her parents, she was preceded in death by her husband Ernest Woody Mullins; and two sisters, Caroline Smith and Barbara Tilley. Mrs. Mullins was a very loving and devout mother and grandmother. She was of the Baptist Faith. Mrs. Mullins is survived by three sons, Jody Vaden (Denise) of Danville, VA, Ricky Vaden of Warington, and Mark Vaden (Crystal) of Danville, VA; one brother Michael Lundy of Winston Salem; six grandchildren, Justin Staley, Austin Vaden, Cody Vaden, Dallas Vaden, Brayden Vaden and Alexis Vaden. Funeral Services will be held at 1PM, Wednesday, March 27, 2019 at Harrelson Funeral Services Chapel. Visitation will be held one hour prior to the service from 12PM til 1PM. In lieu of flowers, memorials may be made to the family c/o of Harrelson Funeral Services, PO Box 1360, Yanceyville, NC 27379. Harrelson Funeral Services of Yanceyville is privileged to be serving the Mullins family.